Bathroom Remodeling | Showers, Tubs, Tiles, Vanities, more! We are retired and on a budget, John was able to remodel our kitchen just the way we wanted. We are retired and on a budget, John was able to remodel our kitchen just the way we wanted. 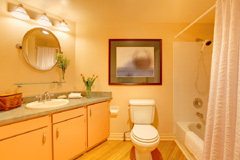 For many years most household bathrooms were very utilitarian in terms of functionality and design, the idea being that this was not an area of the house we would be spending great amounts of time. That standard has changed dramatically over the years as bathrooms have become more and more a place where style and luxury take center stage. Tomlinson Construction approaches every bathroom remodeling project with the idea that a home’s bathroom should be the one place where alone time can be quality time. We design everything from unique floor plans, to tub or shower installations, bathroom vanities, cabinets, sinks, spas, fixtures and lighting, to create the perfect respite from your busy life. Contact us today to learn more! Shower doors, we work with the top company to bring you a custom look. Steam room, we can build or convert your shower into a steam room. Vanities, we are factory certified installers for many popular brands. Counters, we install both tile and solid surface materials. Flooring, we install tile, vinyl and hardwood. Plumbing, we do both supply and drain plumbing and use copper, abs, and steel. Electrical, we do all of our own electrical work from the panel to final trim. Demo, we recycle your waste materials. Permits, we work with the city and hold all inspections and leave the card with you.